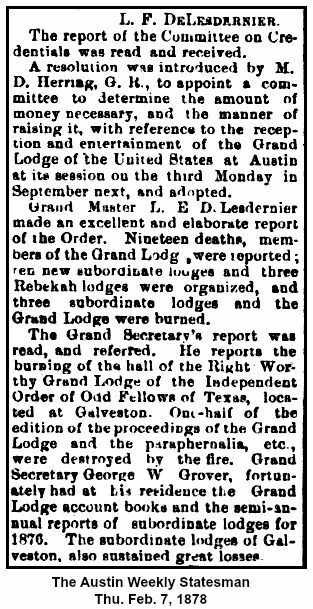 When Grand Master LF de Lesdernier called to order the thirty seventh annual session of the Grand Lodge of Texas in the city of Austin February 4 1878 it was known and noted that a great misfortune had befallen Odd Fellowship in Texas since the adjournment of the previous session. The old hall on Mechanic street city of Galveston, the property of the Grand Lodge was no longer in existence June 8, 1877 this building in connection with many others in the same vicinity was destroyed by a disastrous fire which laid waste much valuable property the Washington Hotel and the large printing establishment of Shaw & Blaylock having been among the buildings destroyed. The loss of its property was a severe blow to Texas Odd Fellowship. The monthly rentals derived therefrom had formed no inconsiderable factor in helping to take care of the expenses of the Grand Lodge during the days in which its treasury was bankrupt. And in fact when this treasury had reached the time when it was not altogether depleted the revenues derived from the hall property probably saved the Grand Lodge the necessity of making assessments upon the subordinate lodges. But now the old hall was gone. Here the Grand Lodge had met for the greater part since 1844 a period of thirty three years. The records for the thirty six years of its existence the written minutes from 1841 to 1851 as well as the printed records from 1851 to 1877 had been devoured by the flames. The reports from the subordinate lodges which had been accumulating during the period of their respective existences had been converted into ashes and scattered before the winds of heaven. Fortunately Grand Secretary Geo W. Grover had the subordinate lodge reports for 1876 as well as his ledger of accounts at his residence and thus saved these from destruction. All else was a total loss. The sacred walls of the old hall that had witnessed the struggles of Odd Fellowship in the days of its infancy lay amid the wreck and debris of the angry flames or having been entirely consumed their ashes mingled with the waters of the briny gulf. Here within these walls the pioneers of the Order in Texas had often met to deliberate and to legislate for the advancement of Odd Fellowship. Here Grand Masters RM Hannay, LP Sundberg, WM Carper, Oscar Farish, LM Hitchcock, S Kirkland, Isadore Dyer, John M Gibson, Dr. Anson Jones and others had presided over meetings of the Grand Lodge of Texas while sustained by a long list of names of brethren equally as zealous and devoted. Click to enlarge images above. 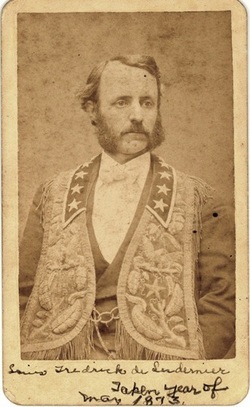 Louis Frederick de Lesdernier IV, son of Captain George Henry and Jane Lucella de Lesdernier, was born on August 27, 1837 in Portland, Maine; they moved to Texas in 1839. 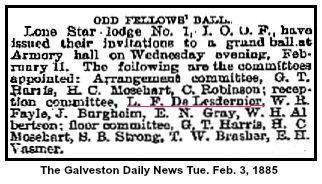 Lesdernier joined the Lone Star Rifles of Galveston, Texas, in Feb. 1861. Lesdernier served until the close of the war in 1865. He married Eliza Jane Grainger of Houston, Texas, in 1867 and they had ten children: Louis Frederick V, Jane Lucile, George Henry, Bessie, Eliza Vive, Stafford Granger, John Reginald, MaBelle, Jamie Granger and Aimee Lee. 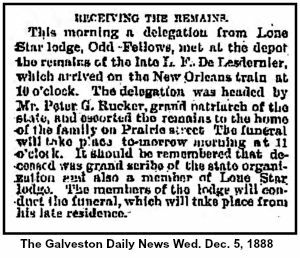 Louis Frederick de Lesdernier died in December of 1888, in Florida and was buried in Glenwood Cemetery in Houston, Texas. (See marker below} There appears to be a discrepancy in the facts as another source stated that he committed suicide in Pensacola, Florida on December 5, 1888. Notice that the marker below says Dec. 1, 1988. Texas, Muster Roll Index Card. 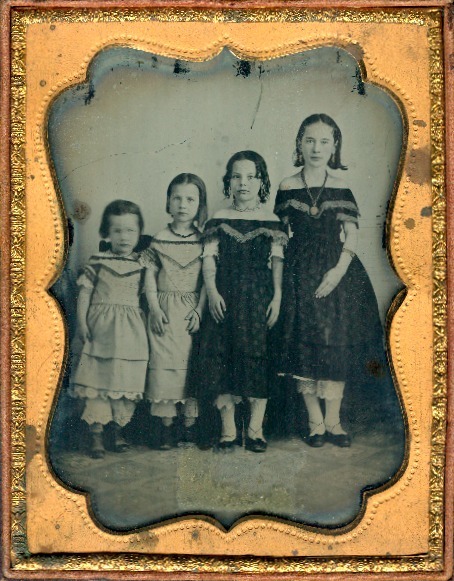 Three of his children with wife Eliza Jane (Grainger). Louis served in the Confederate Army and the Confederate Navy. He enlisted as 3rd Sergeant in the Rio Grande Infantry Regiment on March 9, 1861 for six month’s service under Col. John S. Ford at Brazos Santiago, Texas, a port town at the mouth of the Rio Grande River. The Federal fort and army depot at this town had been seized by Texas troops two months before the outbreak of hostilities at Fort Sumter, South Carolina, and a battery had been set up by the Texans to protect shipping to and from south Texas. By December, 1861, the Union Navy had set up a blockade along the Texas Coast and the Rio Grande Infantry Regiment was moved up the Rio Grande River to Brownsville, Texas. 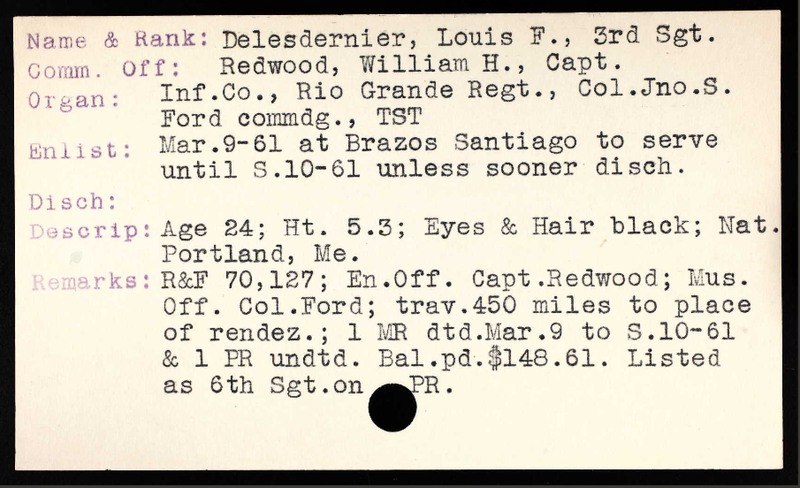 Confederate Army records indicate that Louis Delesdernier also served at Galveston, Texas in 1861 as a Private in Co. L of the Lone Star Rifles, the same unit as his brother, George Delesdernier. The Lone Star Rifles were later incorporated into the Texas Brigade (sometimes referred to as Hood’s Brigade after its commander, John Bell Hood), which was later to distinguish itself on several battlefields in Virginia and at Gettysburg. It does not appear that Louis Delesdernier ever went east to Virginia with his brother. His widow’s pension application indicates that he had enlisted in the Confederate Navy by March 19, 1862 and that he served aboard the CSS General Sterling Price, the CSS Danube, and the CSS Selma over the next two plus years. The General Sterling Price was a side-wheel steamer converted into a ram boat, which served on the Mississippi River during the defense of Memphis, April-June, 1862. She was disabled and sunk on June 6th. 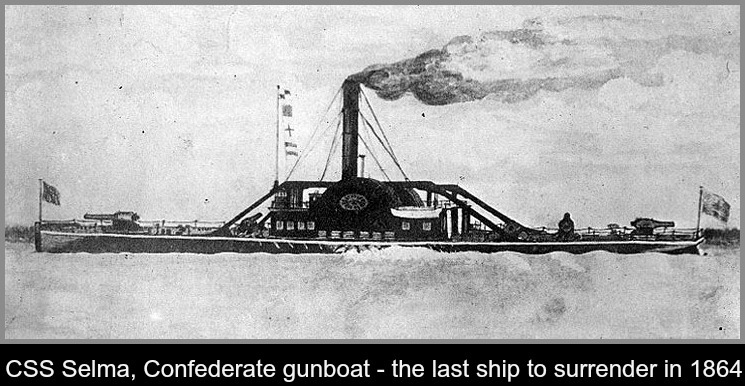 The Danube was a gunboat or “floating battery” anchored in Mobile Bay between 1862 and 1864 and the Selma, also a Confederate gunboat operating in Mobile Bay, was prominent in the crucial Battle of Mobile Bay in August, 1864, the largest naval engagement of the Civil War. She was the last Confederate ship in that battle to surrender. There is no other record of naval duty in his widow’s pension application, so perhaps the surrender of the Selma on August 5, 1864, marked the end of his Confederate naval service.